Grandview Cemetery was begun in 1885 with land purchased from the Cambria Iron Co. The first interment was not until 1887. 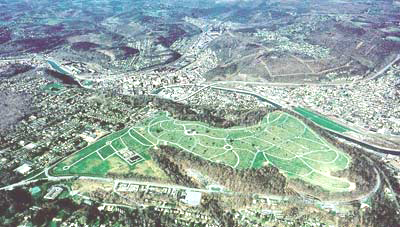 It is the largest cemetery in Cambria County, and in 2006 there were over 60,000 burials. From Rte. 56 in Johnstown, take Rte. 271 (Menoher Blvd) around and up the mountain. Near the top, bear right onto Millcreek Rd. The entrance to the cemetery is on the right side of the road.